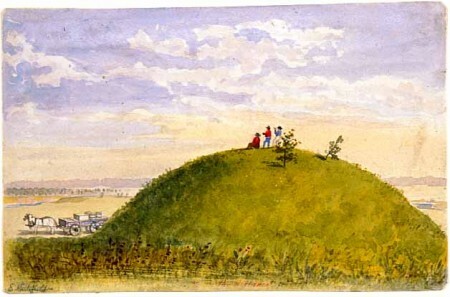 It is no surprise that there are burial mounds in the Hennepin County community called Mound–which was actually named for that feature–as there are in many places around Lake Minnetonka. The lake was an ancient occupation site for the Dakota and other groups, though European-Americans did not know of the place until the 1820s or 1830s, 150 years after their arrival in the Minnesota region. Why then is it a surprise to landowners today that there are mounds at Mound? There’s a report in the August 11, 2009 Finance and Commerce that tells of the latest “discovery” of mounds at Mound, and the financial and legal implications of that fact. The article states that some landowners were not informed of the fact that there might be burial mounds on their property when they bought the property. It says that the landowners thought the mounds “were just hills.” But anyone who knows a little about that area would know that burial mounds were a possibility. Mound, a city on or near the northwestern shore of Lake Minnetonka. . . . The city is named for its aboriginal mounds. Three groups of mounds within the area of the village, mapped by Newton H. Winchell, have respectively 4, 18, and 9 mounds; and at the distance of about a mile westward is a remarkable series of 69 mounds, on the north side of Halsted’s Bay. Upham goes on to say that there were 495 mounds mapped around the shores of Lake Minnetonka, some recorded in Winchell’s book Aborigines of Minnesota, which was published long before there was an Minnesota State Archaeologist–the office that now has the enormous task of keeping records on the location of burial sites. Many of these mounds were destroyed or lowered so that they are not perceived in the landscape. Making people aware of their existence and respecting their continuing presence requires a much greater effort at education than has ever been attempted.